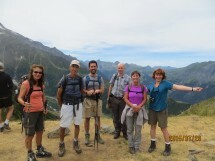 Sunday, July 3, on the Tour du Mont Blanc. (65 km from Geneva). On the Tour of Mont Blanc, we admire the Glacier and the Needles of Bionnassay. Don’t miss an enchanting show. From St Gervais and Champel (1240 m). Walk along the left bank of the river and then climb the metal stairs. All long the path, impressive views of the Glacier and Needles of Bionnassay, also of the Needle and the Dome of Gouter. Walking up on a good way to the Col of Tricot (2120 m). South view on the Domes of Miage, west view on Mont Joly and north view on the Red Needles. On our way back, go down to the Chalets of Miage, then on our right hand enjoy the Gorge of Gruvaz. GR Tour du Pays du Mont Blanc. View of the Arve Valley, the Chains of Aravis and Fiz. Return to Champel. A gradient of 900-1000 m and a distance of 14 km. Walking time: about 6 hours. Meeting point at 08:00 at the French side of the Moellesulaz customs, in front of the Librairie de France.